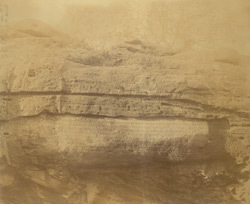 Photograph of the Hathi Gumpha, or Elephant Cave, Udayagiri, near Bhubaneshwar in Orissa, from the Archaeological Survey of India Collections, taken by Alexander E. Caddy in 1895. Most of the series of Jain cave temples at the twin hills of Khandgiri, or Khandagiri and Udayagiri, were excavated under the Chedi dynasty in the 1st century BC. The Hathi Gumpha or Elephant Cave is a large natural cavern which owes its importance to a long inscription of the King Kharavela (reigned 1st century BC) incised over the entrance. This inscription gives much information about the social, the military and the religious organization of that time.